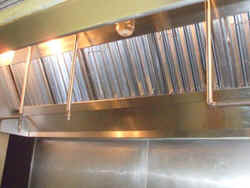 All Clean Power Washing - Springfield, Missouri U.S.A.
We specialize in RESTAURANT EXHAUST HOOD CLEANING. We have also developed a great system for LOW PRESSURE BLACK ROOF ALGAE REMOVAL. Why replace a perfectly good roof when all it needs is a good cleaning. Don't forget that we also clean windows, brick, decks, driveways, stone, exterior walls, patios, siding, fences, automobiles, boats and much more. We use high quality equipment combined with the appropriate safe chemicals. Our equipment can meet all your cleaning needs whether it is HOT or COLD Pressure Washing or cleaning that needs LOW Pressure applications. We would appreciate the opportunity to present a written estimate for any of your power washing or cleaning needs. We will come by, evaluate the work with you, and give you a written proposal. We guarantee to meet or beat any competitors written estimate. Contact us for a proposal or to schedule work.